The increasing number of deaths from bird flu - particularly in Sumatera, Java and Bali - showed a growing need for programmes to raise the awareness of backyard farmers to the dangers of bird flu. 1. To encourage behavioral change in backyard poultry farming methods that put people in danger of catching bird flu. 2. To inform people about ways to protect themselves, their families and their communities from bird flu. 3. 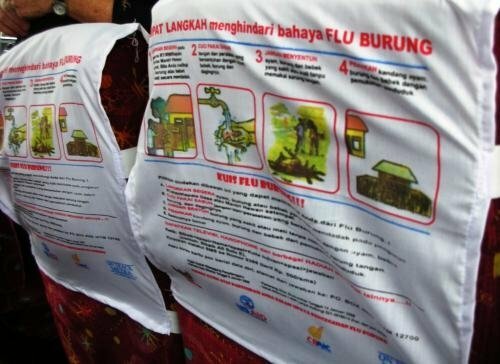 To target this public awareness initiative in the eight target areas that have the biggest number of human fatalities in Indonesia from bird flu. 4. To establish systems and practices so that this public awareness strategy can be expanded easily, quickly and cheaply to other areas of Indonesia, should the threat or messages needed to combat bird flu increase or change. In line with discussions with CBAIC staff, we designed a public awareness campaign to deliver key life-saving messages to people who engage in backyard and home farming practices. The primary target group for this project was poor people in Jakarta who returned home for the Idul Fitri holiday. The secondary target group for this project was villagers and their families in specific affected areas in North Sumatera, Lampung, Banten, West Java, Central Java, DI Jogjakarta, East Java, and Bali. The method of reaching these Jakarta workers and their families/communities was bus transportation as many Jakarta workers use buses to go home during the mass exodus from the capital for the annual Idul Fitri holidays. The reason this group was targeted was because Jakarta is one of the biggest population groups within the biggest victim groups and their families are also in the biggest victim group. They not only need to know safe backyard poultry farming practices for themselves but also want to spread this information to their home communities who have already suffered loss and need to learn how to protect themselves against future threats. These Jakarta travelers were exposed, for many hours, to messages that taught them, their families, their communities and people in their Jakarta homes, about the best practices for backyard poultry farming. The messages provided four key tips on how to care for poultry safely. Cartoon illustration and written messages were featured on the back of the seat covers on 360 buses. Posters, banners and stickers were also displayed in bus pools, airports and bus terminals across Java. A competition was used to encourage travelers to understand the messages pictured in front of them and spread them to their families at home and take them back to Jakarta. The competition continued until January 15, 2008, to reach bus users through the busiest periods of the year (Idul Fitri, Idul Adha, Christmas and New Year holidays). The bus companies fully supported this initiative and said they would allow the 20,000 seatback covers to remain in place indefinitely – so these messages will continue to reach travelers and their communities far beyond the life of this project and competition.